The obesity rate for Caucasian adults 18 years and older (over 30 BMI) in the US in 2015 was 29.7%. For adult Caucasian men, the rate of obesity was 31.1% in 2015. For adult Caucasian women, the rate of obesity was 27.5% in 2015. The most recent statistics from the NHANES of age adjusted obesity rates for Caucasian adults 20 years and older in the U.S. in 2016 was 37.9%. The obesity rates of Caucasian males and Caucasian females from the NHANES 2016 data were relatively equivalent, obesity rates were 37.9% and 38.0%, respectively. This large jump in obesity rate could possibly be attributed to the fact when teenagers of 18 and 19 years old are classified as adults instead of adolescents, their much lower rates of obesity skew and bring down the adult average. "More than 80 percent of affected children become overweight adults, often with lifelong health problems." Children are not only highly at risk of diabetes, high cholesterol and high blood pressure but obesity also takes a toll on the child's psychological development. Social problems can arise and have a snowball effect, causing low self-esteem which can later develop into eating disorders. The United States' high obesity rate is a major contributor to its relatively low life expectancy relative to other high-income countries. It has been suggested that obesity may lead to a halt in the rise in life expectancy observed in the United States during the 19th and 20th centuries. In the event that obesity continues to grow in newer generations, a decrease in well being and life span in the future generations may continue to degenerate. According to Olshansky, obesity diminishes "the length of life of people who are severely obese by an estimated 5 to 20 years." History shows that the number of years lost will continue to grow because the likelihood of obesity in new generations is higher. Children and teens are now experiencing obesity at younger ages. They are eating less healthier and are becoming less active, possibly resulting in less time lived compared to their parents' . The life expectancy for newer generations can expect to be lower due to obesity and the health risks they can experience at a later age. ^ a b Antonelli JA, Maalouf NM, Pearle MS, Lotan Y (October 2014). "Use of the National Health and Nutrition Examination Survey to calculate the impact of obesity and diabetes on cost and prevalence of urolithiasis in 2030". European Urology. 6 (4): 724–9. doi: 10.1016/j.eururo.2014.06.036. PMC 4227394. PMID 25015037. ^ a b c Blackburn GL, Walker WA (July 2005). "Science-based solutions to obesity: what are the roles of academia, government, industry, and health care?". The American Journal of Clinical Nutrition. 82 (Suppl 1): 207S–210S. doi: 10.1093/ajcn/82.1.207S. PMID 16002821. ^ a b c Andreyeva T, Sturm R, Ringel JS (December 2004). "Moderate and severe obesity have large differences in health care costs". Obesity Research. 12 (12): 1936–43. doi: 10.1038/oby.2004.243. PMID 15687394. ^ a b c Wolf AM (April 1998). "What is the economic case for treating obesity?". Obesity Research. 6 (Suppl 1): 2S–7S. doi: 10.1002/j.1550-8528.1998.tb00682.x. PMID 9569170. ^ a b c Sturm R (2002). "The effects of obesity, smoking, and drinking on medical problems and costs" (PDF). Health Affairs. 21 (2): 245–53. doi: 10.1377/hlthaff.21.2.245. PMID 11900166. ^ a b c d e Finkelstein EA, Fiebelkorn IC, Wang G (2003). "National Medical Spending Attributable To Overweight And Obesity: How Much, And Who's Paying?". Health Affairs. 3 (1): 219–226. doi: 10.1377/hlthaff.w3.219. ^ a b Thompson D, Wolf AM (August 2001). "The medical-care cost burden of obesity". Obesity Reviews. 2 (3): 189–97. doi: 10.1046/j.1467-789x.2001.00037.x. PMID 12120104. ^ Stevens J, Keil JE, Rust PF, Tyroler HA, Davis CE, Gazes PC (June 1992). "Body mass index and body girths as predictors of mortality in black and white women". Archives of Internal Medicine. 152 (6): 1257–62. doi: 10.1001/archinte.1992.00400180111018. PMID 1599355. ^ Sanchez CE, Barry C, Sabhlok A, Russell K, Majors A, Kollins SH, Fuemmeler BF (2018). "Maternal pre‐pregnancy obesity and child neurodevelopmental outcomes: a meta‐analysis". Obesity Reviews. 19 (4): 464–484. doi: 10.1111/obr.12643. PMC 6059608. PMID 29164765. ^ Marchi J, Berg M, Dencker A, Olander EK, Begley C (August 2015). "Risks associated with obesity in pregnancy, for the mother and baby: a systematic review of reviews" (PDF). Obesity Reviews. 16 (8): 621–38. doi: 10.1111/obr.12288. PMID 26016557. ^ Modrek S, Basu S, Harding M, White JS, Bartick MC, Rodriguez E, Rosenberg KD (2017). "Does breastfeeding duration decrease child obesity? An instrumental variables analysis". Pediatric Obesity. 12 (4): 304–311. doi: 10.1111/ijpo.12143. PMID 27161761. ^ Schwartz MB, Puhl R (February 2003). "Childhood obesity: a societal problem to solve". Obesity Reviews. 4 (1): 57–71. doi: 10.1046/j.1467-789X.2003.00093.x. PMID 12608527. ^ Ogden CL, Carroll MD, Flegal KM (May 2008). "High body mass index for age among US children and adolescents, 2003-2006". JAMA. 299 (20): 2401–5. doi: 10.1001/jama.299.20.2401. PMID 18505949. ^ Ogden CL, Carroll MD, Curtin LR, Lamb MM, Flegal KM (January 2010). 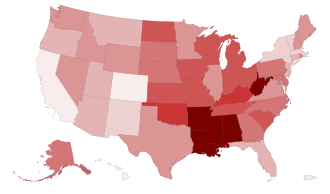 "Prevalence of high body mass index in US children and adolescents, 2007-2008". JAMA. 303 (3): 242–9. doi: 10.1001/jama.2009.2012. PMID 20071470. ^ Deng T, Lyon CJ, Bergin S, Caligiuri MA, Hsueh WA (May 2016). "Obesity, Inflammation, and Cancer". Annual Review of Pathology. 11 (1): 421–49. doi: 10.1146/annurev-pathol-012615-044359. PMID 27193454. ^ Bradway C, DiResta J, Fleshner I, Polomano RC (August 2008). "Obesity in nursing homes: a critical review". Journal of the American Geriatrics Society. 56 (8): 1528–35. doi: 10.1111/j.1532-5415.2008.01821.x. PMID 18662208. ^ Cawley, John; Maclean, Johanna Catherine (2012). "Unfit for Service: The Implications of Rising Obesity for Us Military Recruitment". Health Economics. 21 (11): 1348–1366. doi: 10.1002/hec.1794. ISSN 1099-1050. ^ Ezzati M, Martin H, Skjold S, Vander Hoorn S, Murray CJ (May 2006). "Trends in national and state-level obesity in the USA after correction for self-report bias: analysis of health surveys". Journal of the Royal Society of Medicine. 99 (5): 250–7. doi: 10.1258/jrsm.99.5.250. PMC 1457748. PMID 16672759. ^ a b Wang Y, Beydoun MA, Liang L, Caballero B, Kumanyika SK (October 2008). "Will all Americans become overweight or obese? 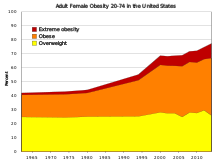 estimating the progression and cost of the US obesity epidemic". Obesity. 16 (10): 2323–30. doi: 10.1038/oby.2008.351. PMID 18719634. ^ Moellering DR, Smith DL (March 2012). "Ambient Temperature and Obesity". Current Obesity Reports. 1 (1): 26–34. doi: 10.1007/s13679-011-0002-7. PMC 3975627. PMID 24707450. ^ Bray MS, Loos RJ, McCaffery JM, Ling C, Franks PW, Weinstock GM, Snyder MP, Vassy JL, Agurs-Collins T (January 2016). "NIH working group report-using genomic information to guide weight management: From universal to precision treatment". Obesity. 24 (1): 14–22. doi: 10.1002/oby.21381. PMC 4689320. PMID 26692578. ^ Biener AI, Decker SL (January 2018). "Medical Care Use and Expenditures Associated With Adult Obesity in the United States". JAMA. 319 (3): 218. doi: 10.1001/jama.2017.21063. PMID 29340665. ^ Rice TM, Zhu M (January 2014). "Driver obesity and the risk of fatal injury during traffic collisions". Emergency Medicine Journal. 31 (1): 9–12. doi: 10.1136/emermed-2012-201859. PMID 23337422. ^ Tsai AG, Williamson DF, Glick HA (January 2011). "Direct medical cost of overweight and obesity in the USA: a quantitative systematic review". Obesity Reviews. 12 (1): 50–61. doi: 10.1111/j.1467-789X.2009.00708.x. PMC 2891924. PMID 20059703. ^ Wang G, Dietz WH (May 2002). "Economic burden of obesity in youths aged 6 to 17 years: 1979-1999". Pediatrics. 109 (5): E81–1. doi: 10.1542/peds.109.5.e81. PMID 11986487. ^ Byck GR (July 2000). "A comparison of the socioeconomic and health status characteristics of uninsured, state Children's health insurance program-eligible children in the united states with those of other groups of insured children: implications for policy". Pediatrics. 106 (1 Pt 1): 14–21. doi: 10.1542/peds.106.1.e14. PMID 10878143. ^ Preston SH, Stokes A (November 2011). "Contribution of obesity to international differences in life expectancy". American Journal of Public Health. 101 (11): 2137–43. doi: 10.2105/AJPH.2011.300219. PMC 3222401. PMID 21940912. ^ a b c Olshansky SJ, Passaro DJ, Hershow RC, Layden J, Carnes BA, Brody J, Hayflick L, Butler RN, Allison DB, Ludwig DS (March 2005). "A potential decline in life expectancy in the United States in the 21st century". The New England Journal of Medicine. 352 (11): 1138–45. doi: 10.1056/NEJMsr043743. PMID 15784668. ^ Stewart ST, Cutler DM, Rosen AB (December 2009). "Forecasting the effects of obesity and smoking on U.S. life expectancy". The New England Journal of Medicine. 361 (23): 2252–60. doi: 10.1056/NEJMsa0900459. PMC 4394736. PMID 19955525. ^ a b c d Kersh R (March 2009). "The politics of obesity: a current assessment and look ahead". The Milbank Quarterly. 87 (1): 295–316. doi: 10.1111/j.1468-0009.2009.00556.x. PMC 2879181. PMID 19298424. ^ Gonzalez-Suarez C, Worley A, Grimmer-Somers K, Dones V (November 2009). "School-based interventions on childhood obesity: a meta-analysis". American Journal of Preventive Medicine. 37 (5): 418–27. doi: 10.1016/j.amepre.2009.07.012. PMID 19840696. ^ Boles M, Adams A, Gredler A, Manhas S (October 2014). "Ability of a mass media campaign to influence knowledge, attitudes, and behaviors about sugary drinks and obesity". Preventive Medicine. 67 (Suppl 1): S40–5. doi: 10.1016/j.ypmed.2014.07.023. PMID 25066020. ^ Holzman DC (April 2010). "White House proposes healthy food financing initiative". Environmental Health Perspectives. 118 (4): A156. doi: 10.1289/ehp.118-a156. PMC 2854743. PMID 20359982.